Balloons is a free Joomla! 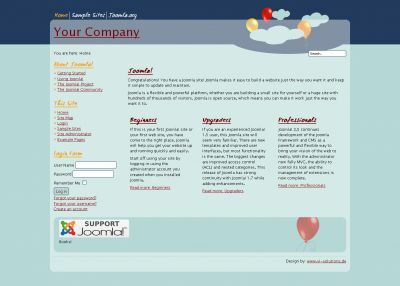 Template for Joomla! 3.x . Flat login menu on top of page. Parameter to set text "Your Company". position-10: Module beneath content. If there are several postion-10 modules their width will be adjusted and the modules are positioned side by side. Variable width: pages adjusts to browser window width. Minwidth 720 px per default so that the page can be seen in small browsers without scrollbar. Minwidth can be set to another value by parameters.